RAS ToppersNotes contains handwritten book covering General studies syllabus for both RPSC Pre & Mains. Why choose Toppersnote’s General Studies paper 2? Collected from top coachings and written by top students. Covers General Studies syllabus in detail for both Pre & Mains. Brings you onboard with mainstream RAS preparation so that you don’t miss anything. RAS Handwritten Notes General studies Paper 2 contains three volumes having a total of 529 pages. All the topics for GS Paper 2 are covered in these three volumes like Ethics, LAW General Science and Technology Natural resources &Geophysical Phenomena,World geography,Indian geography etc. 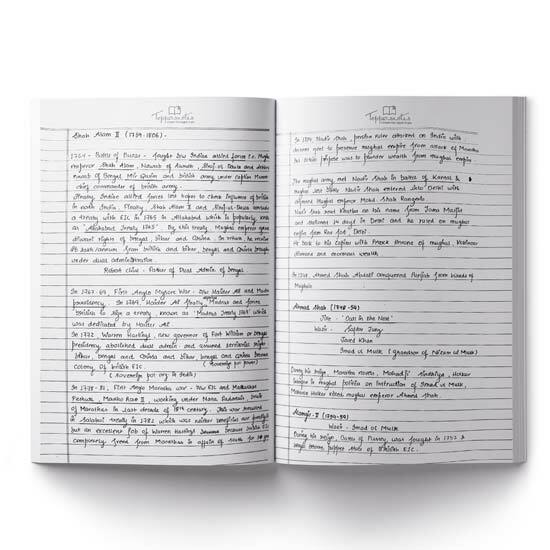 RAS Hand Written Notes General Studies Paper II (English) contains handwritten books covering General studies syllabus for both RPSC Pre & Mains. RPSC is a highly competitive exam and it needs a lot of hard work, knowledge, and skill set to crack it. We, at Toppersnotes, understand the need of having the right knowledge for RAS. A lot of RAS aspirants in our survey said that they do not know how to start? & what to study? We have rigorously thought over the matter and have realized that no one knows it better than those who have prepared and cracked it. The other set of people are coaching institutes. They have been working over the years to master the field of RAS. We have come up with a product named Toppersnotes for RAS, which is a perfect fusion of experience and hard work of both RAS Rankers and the coaching institutes. These notes are carefully compiled with good handwriting to give you short and concise theory on the topics which you need to learn and where you need to focus upon. Toppersnotes will surely get you started and give you the best direction for your RAS preparations. The notes will do wonder to your preparation if you also do following things. You will need to go through NCERT books which are a good source of vast knowledge and a prominent part of our education system. Join a reputed test series. Go through newspapers and keep yourself updated about everything going around the world. 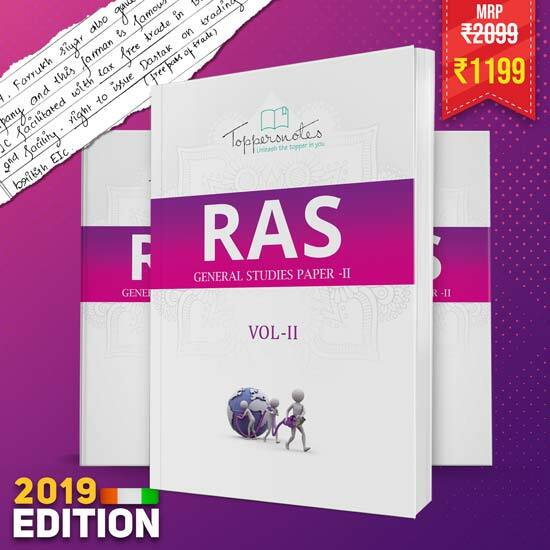 RAS toppers Handwritten Notes- General studies paper-2 are the result of efforts of various RAS aspirants, teachers, and toppers. Notes contain study material in a very short and concise form and cover the facts and figures which are required for the exam. RAS Notes can serve as a good source of study material for those who are preparing from home and not attending any coaching institute. Natural Resources Across the world and Geophysical Phenomena.